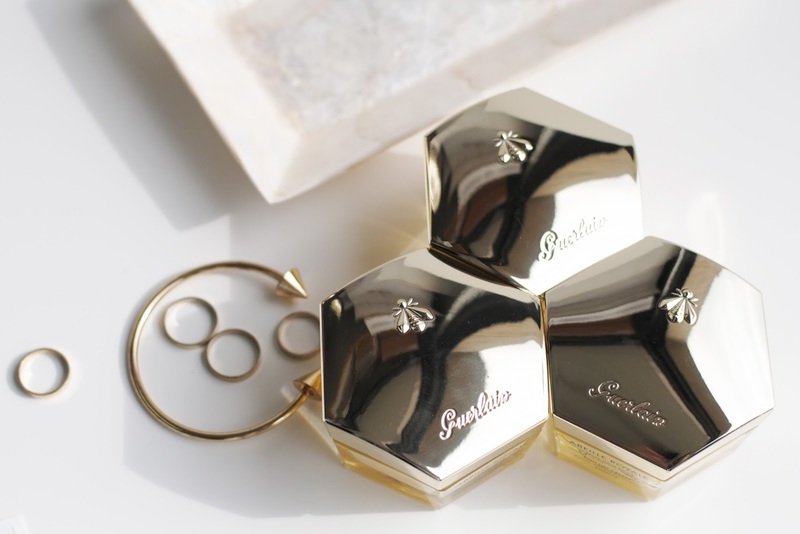 Guerlain is just my brand. 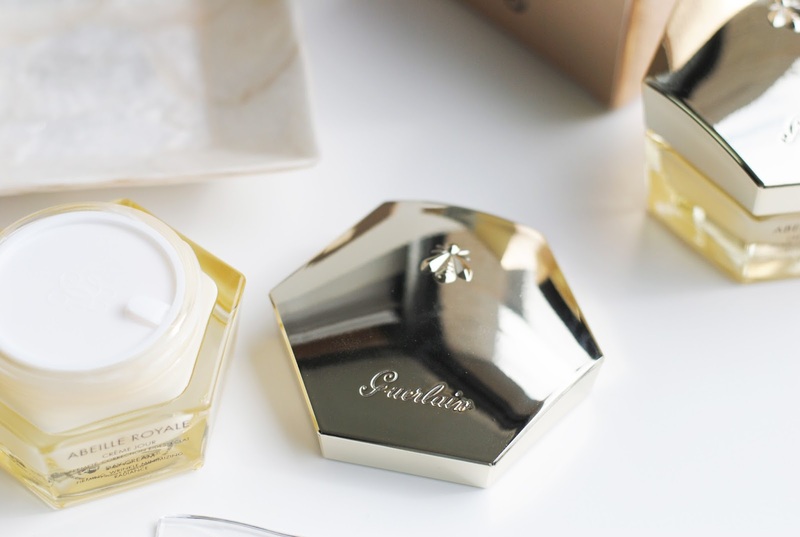 Seriously, I would be okay with getting a lifelong supply of Guerlain products and never using other brands again. That says a lot doesn't it? 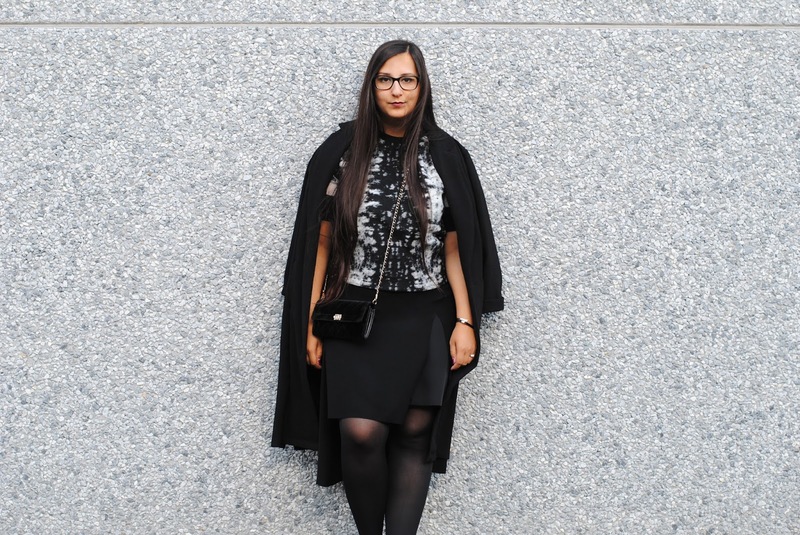 I'm already even dreaming of the holiday collection (more about that below). 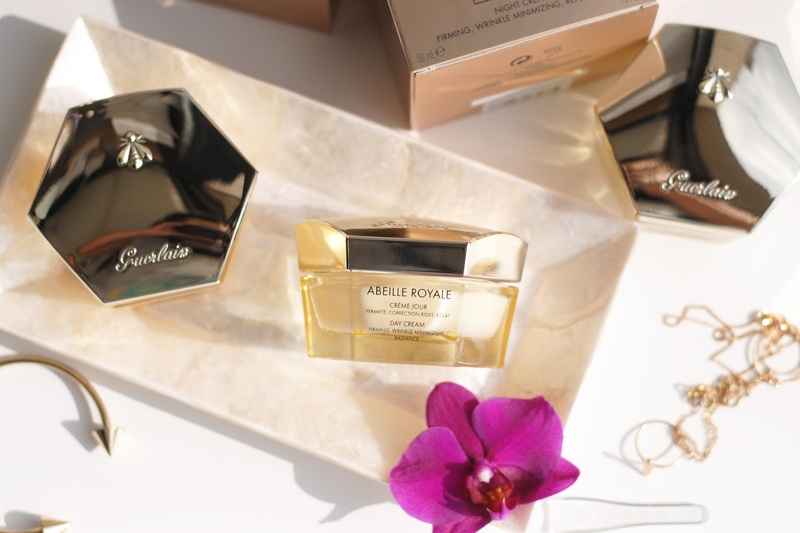 But let's not get ahead, in a few days I'm showing you the fall collection and right now it's time for the renewed Abeille Royale Day and Night creams! First things first: this packaging! 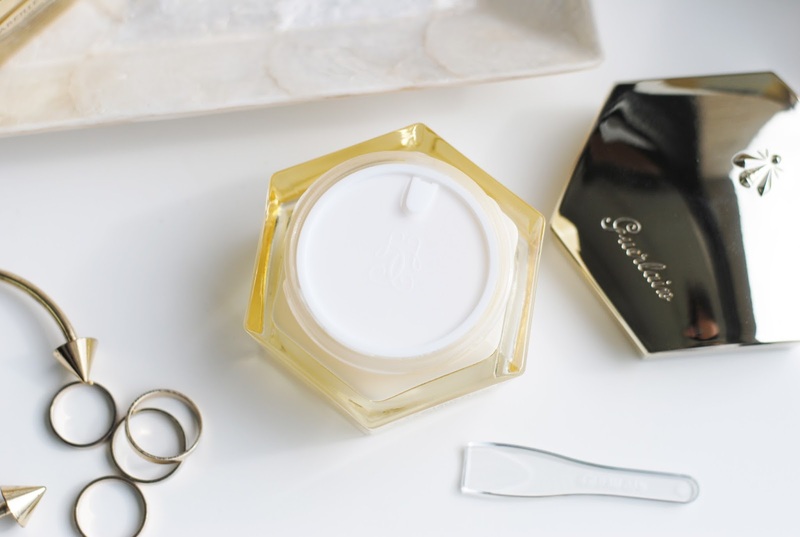 The jar looks so luxurious, with a gold lid engraved with Guerlain and a bee. The jar has a hexagonal shape, just like a honeycomb. The jar comes with a little spatula, I prefer a bottle with a pump because it's more hygienic, but oh well - I'm too sold with the design to let the jar packaging be an issue. The new day cream exist out of a healing concentrate that works on all essential levels of the skin to improve the quality of skin structure and overall appearance. 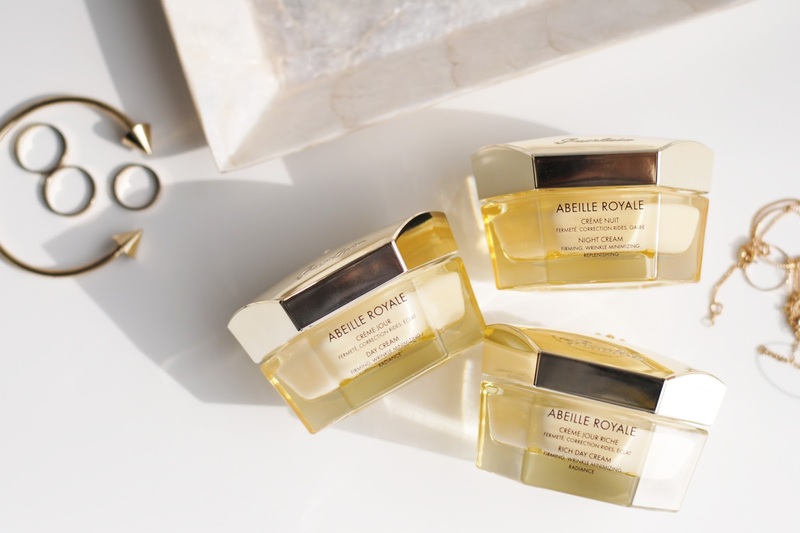 Honey of Ouessant is one of the main ingredients of the Abeille Royale line (more about the honey below). It promotes production of 2 proteins (cornifin and elafin) that help form the skin barrier. 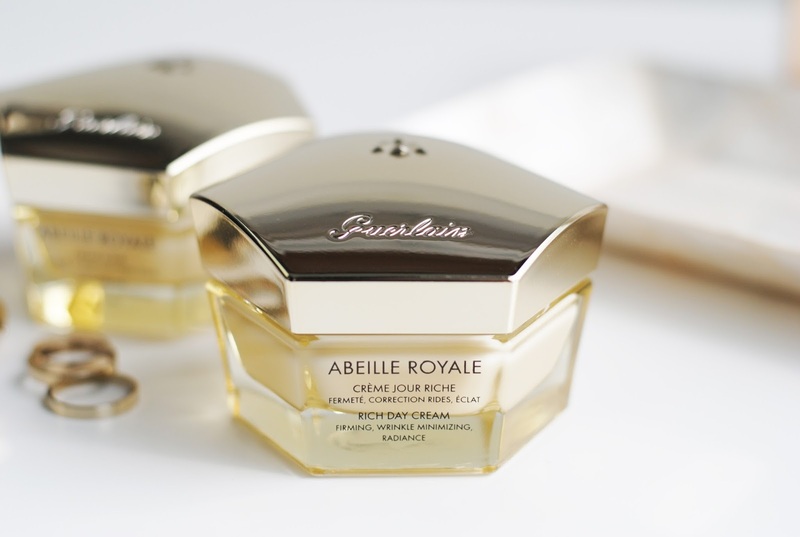 Guerlain also added 2 kinds of hyaluronic acid. One to hydrate the skin, smoothen the skin and blur fine lines. And the other to stimulate the formation epidermal cells and that way reduce superficial blemishes and to stimulate the generation of collagen and fibroblasts. I'm loving this cream, it feels nice on the skin and smears out well. It doesn't feel greasy or sticky at all, and doesn't leave a particularly dewy or matte finish. Just a really natural glow. I could see an immediate result when I started using it, more radiance. 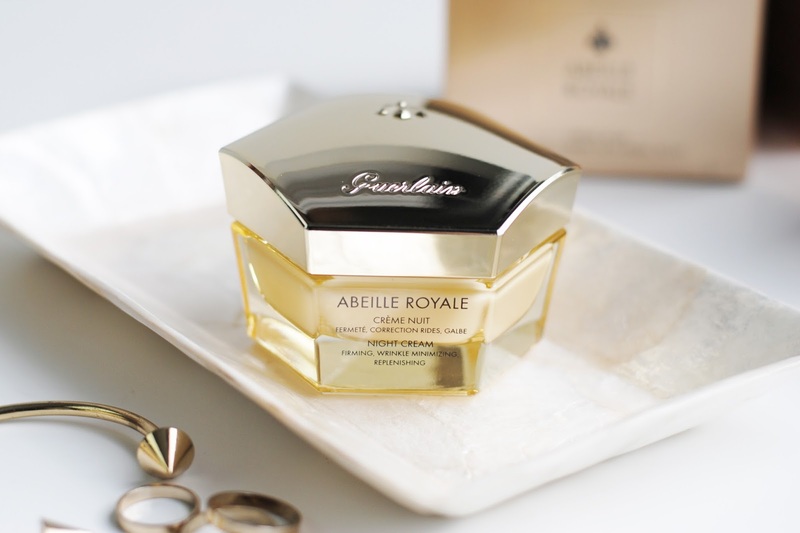 The line has a scent of honeylike notes combined with floral notes from mimosa and broom with fresh grasses. 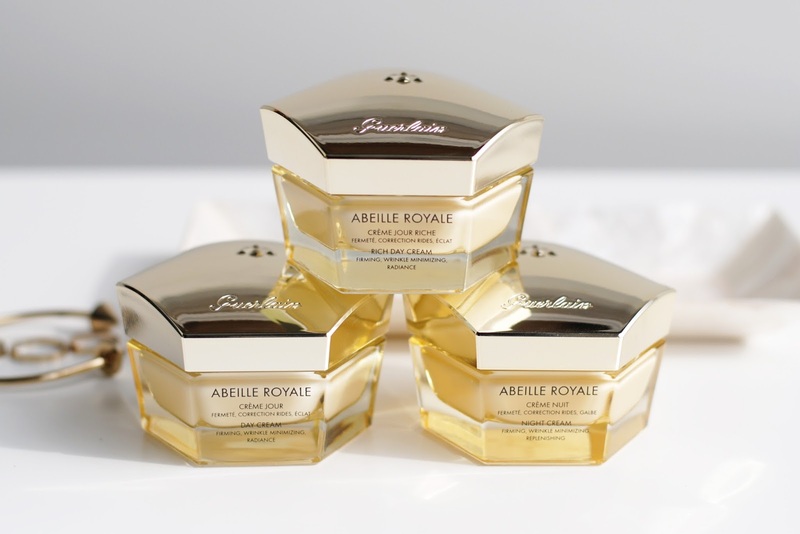 Guerlain always has well combined scents for their lines that are truly recognizable. The method and specific ingredients are described above. 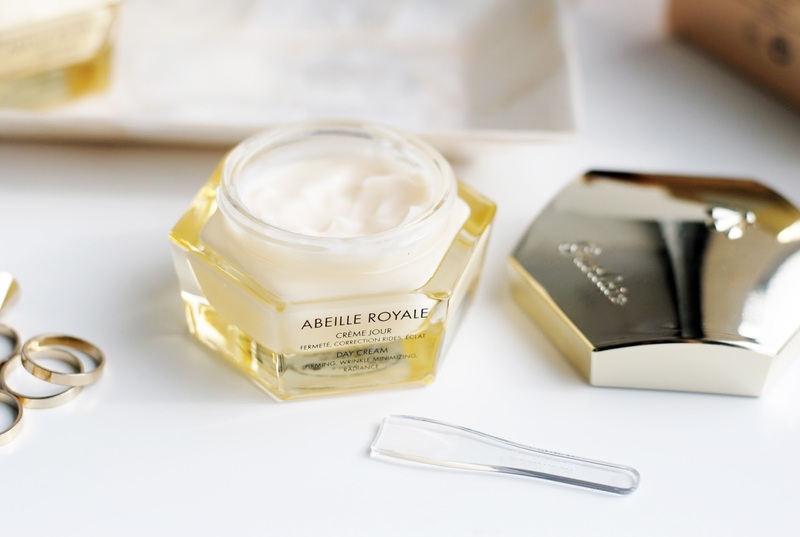 The day cream and rich day cream have a lot of ingredients in common, but the rich day cream has more moisturizing ingredients and is more suitable for mature skin. My mom tried out this cream, and she loved it. A nice feeling, easy to use, no greasy layer and she could detect a more radiant glow and more firmness of the skin in just a few days! 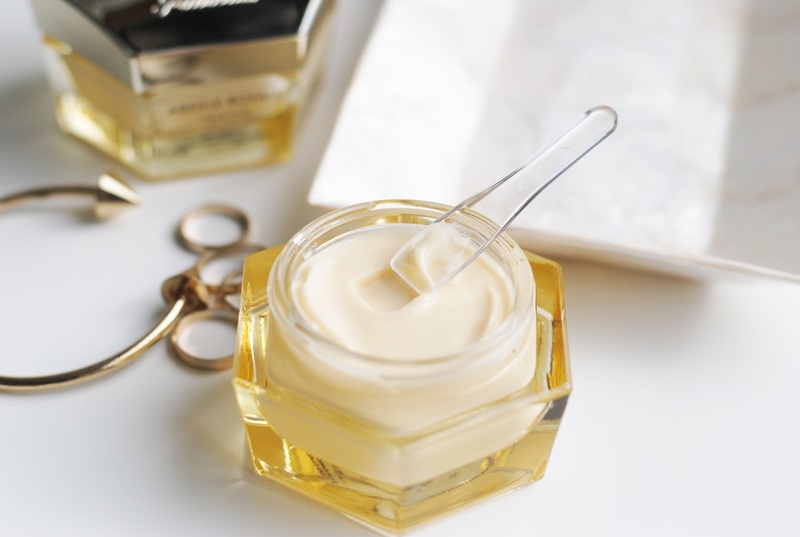 The night cream differs more in ingredients, ingredient wise it contains more silicons and that among other ingredients (like squalane) makes the structure of the cream less fluid than the other creams. It melts on the skin, and smears out really well again. 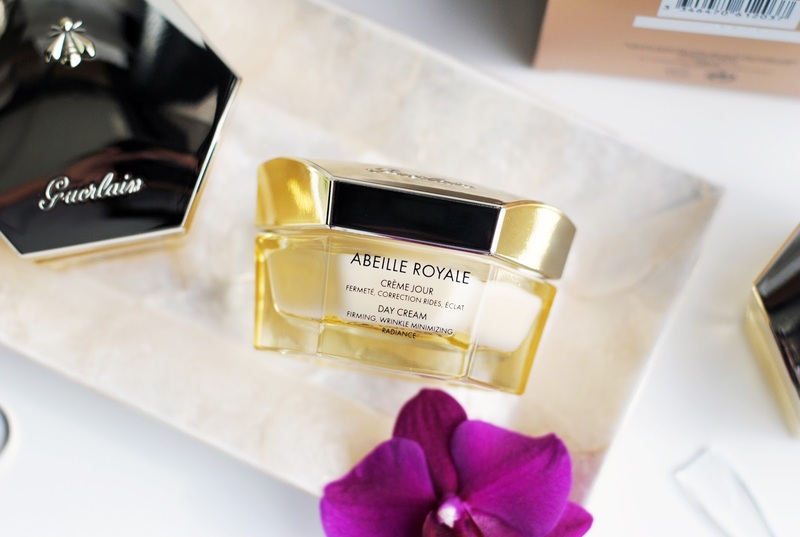 I'm more of a fan of the day cream, which I find amazing. Personally I prefer a fluid, and very hydrating mask for the night. I would recommend this cream for ages 35+, for skin that is more mature and needs more recovering and firming. 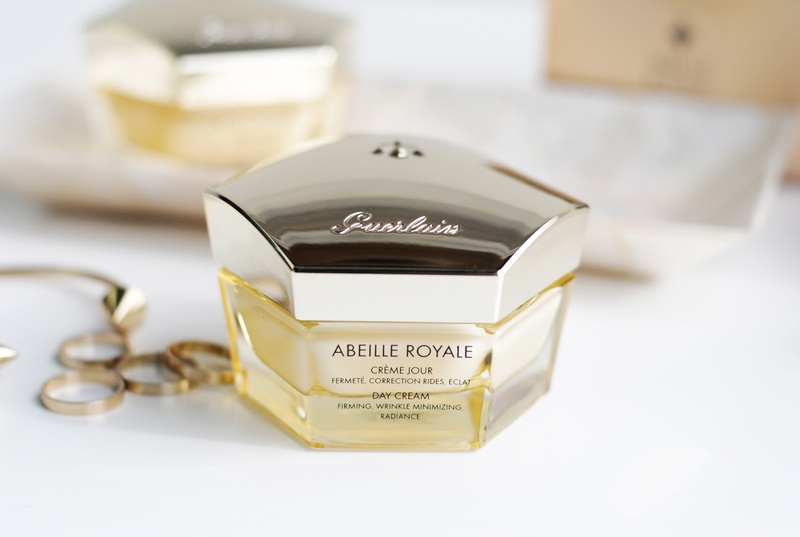 The Guerlain Abeille Royale line uses honey harvested on the island 'Ouessant', a local black bee makes honey that has a light salty taste because it's rich in minerals and amino acids. These elements are active in connectie tissue and the formation of collagen and elastin fibers. Anti-age! 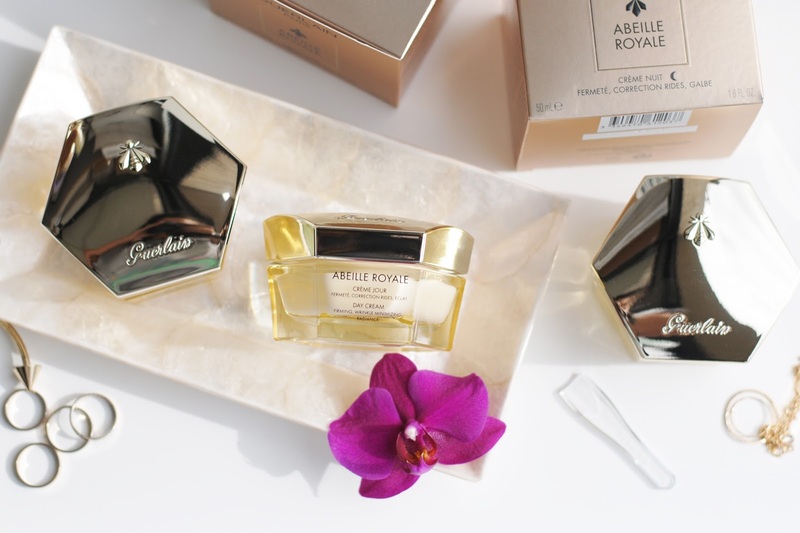 And another bees ingredient is the royal gelly of Sologne which makes the skin more firm. I went through every ingredient, and the only negative thing is the fragrance. The creams have a scent (and I personally love a scent in my skincare) and those fragrance ingredients can trigger sensitivity. Other than that there are only beneficial ingredients in the creams. The alcohol used is fatty alcohol, which is not harmful at all. They are not drying or sensitizing. In the main ingredients there also is a silicon (cyclopentasiloxane), water-thin and volatile - so it will even evaporate. 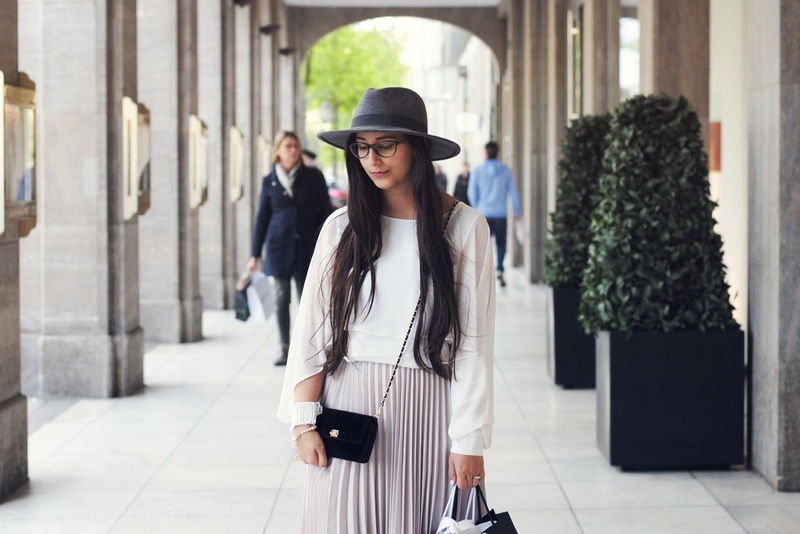 Who is afraid of silicons? Just some words about silicons, because they're a bit of misunderstood ingredients. Silicons are NOT in fact bad. (I'm talking about skincare now, in haircare there might be a difference in rinsing out different kinds of silicons.) The best and easiest way to put it is in the text below, written by the skincare experts at Paula's Choice. I couldn't have said it better. "Claims that silicones in any form cause or worsen skin concerns have not been substantiated in published research, nor have reports that silicones are sensitizing to or “suffocate” skin. Almost all of these claims are either myths or based on anecdotal evidence, which isn’t the best way to determine the safety or efficacy of any cosmetic ingredient. How do we know that silicones don’t suffocate skin? Because of their molecular properties they are at the same time porous and resistant to air. Think of silicones in a skincare formula like the covering of a tea bag. When you steep the tea bag in water the tea and all of its antioxidant properties are released. 1) "The Cosmetic Ingredient Review (CIR) Expert Panel assessed the safety of different silicons as used in cosmetics. The Expert Panel reviewed the available animal and clinical data as well as information from a previous CIR safety assessment of amorphous silica and concluded that silicons are safe as used when formulated and delivered in the final product not to be irritating or sensitizing to the respiratory tract." Becker LC1, Bergfeld WF, Belsito DV, Hill RA, et all. Safety assessment of silylates and surface-modified siloxysilicates. 2013 May-Jun;32(3 Suppl):5S-24S. doi: 10.1177/1091581813486299. Whew, that was quite the blogpost right? I did intensive research because I found some reviews that I didn't agree on, so I dug deep and I loved telling you more about ingredients and so on. 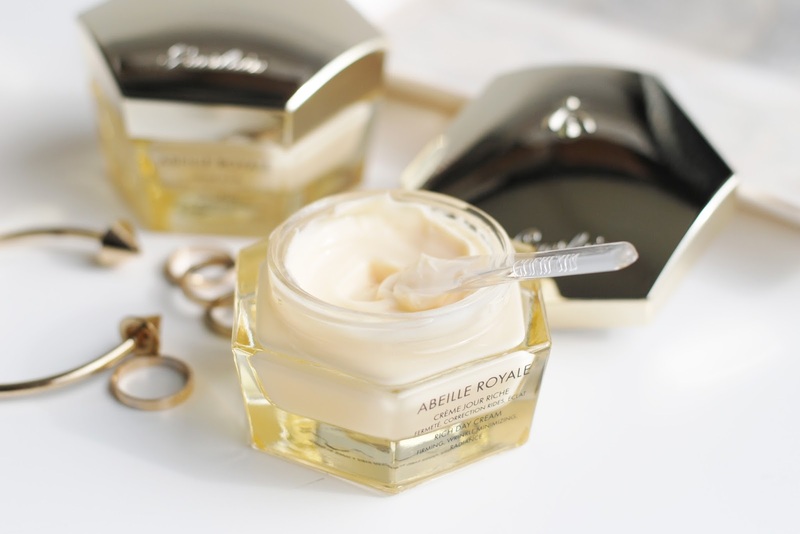 I'm a fan of these creams, especially the regular day cream suits me really well. 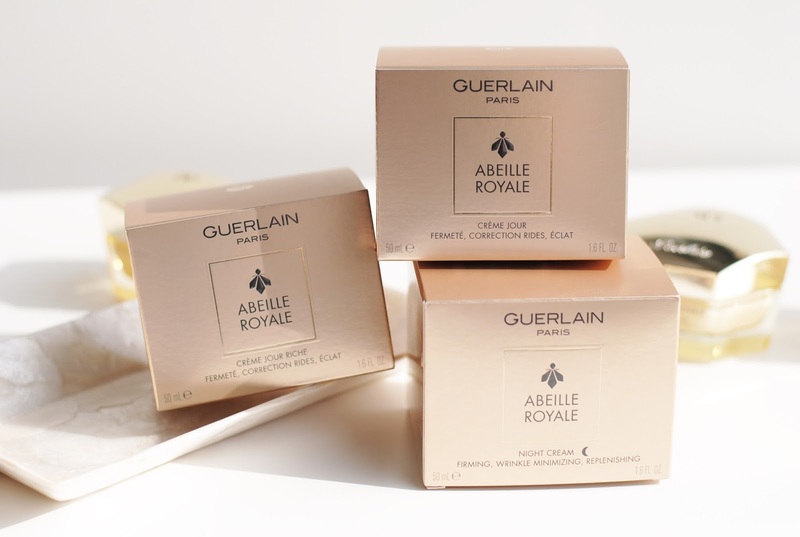 I am definitely ready to try some more Guerlain skincare, because so far it hasn't let me down. Almost forgot! 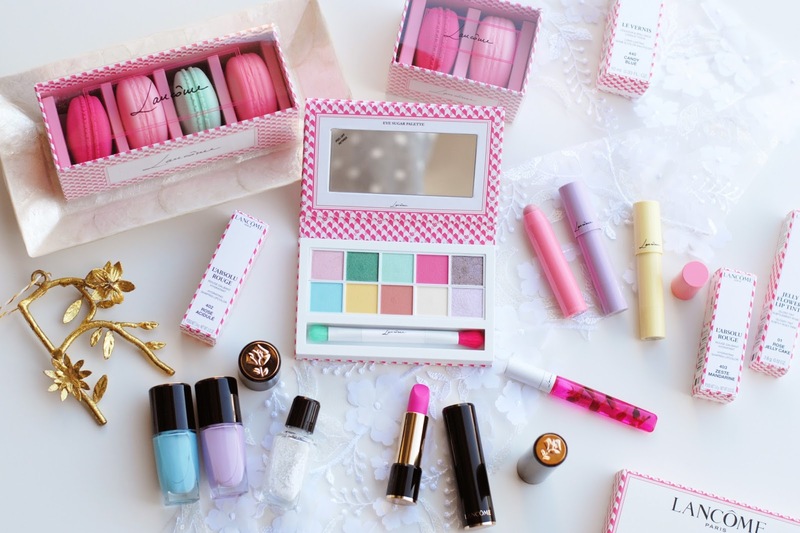 I was going to say something about the Guerlain holiday collection! The theme is Shalimar, yep, an hommage to the fragrance. The collection is going to be royal blue and I want just every. single. piece. The 2 products that I am completely lusting over are the meteorites and a gorgeous hair and body powder. Can't wait till November! Did you like a more extensive look at the ingredients? I like the fact that you told us more about the ingredients, like the piece about silicones, it's really interesting! And something about the product: the design of those jars are so beautiful! Really like that honeycomb structure combined with the gold color. Such a clear review! I love how you explain everything so well! LOVE with big letters the packaging :-D . Great post and beautiful pictures :) !!! Super artikel, fijn die background information! De producten lijken me top!